Veteran interviewer Sir David Frost is back on Al Jazeera English (GOtv channel 40) with another series of intimate hour-long interviews. As one of the worlds’s most respected and well know television interviewers he speaks to some of the world’s most influential people in intimate surroundings. He’s granted access into their lives, uncovering hidden depths with his guests. Catch Sheikh Hasina, Prime Minister of Bangladesh on The Frost Interview, 13 September at 9:00PM. In this King-Fu action comedy, our hero learns the difficult style of the monkey from an old master through countless bloody encounters. He becomes an expert defeating his foe using Monkey Kung Fu. Airing September 13 at 6:00PM on Black Belt TV (GOtv channel 12). Where better to spend your Saturday mornings than in the Mickey Mouse Clubhouse with Mickey and his mates? On Saturday 14 September we have the premiere of our special, The Wizard of Dizz, at 08:40PM. Minnie and Pluto find themselves in the silly but spectacular land of Dizz. With the help of some new friends they set off to ask the wonderful Wizard of Dizz to make their dreams come true. Catch Disney Junior of GOtv Plus channel 60. Po, the Dragon Warrior panda, continues leading the Furious Five in maintaining calm in the Valley Of Peace. With Tigress, Monkey, Mantis, Crane, Viper and Shifu fighting by his side, Po defends the Jade Palace against all intruders with his trademark panda moves, and leaving plenty of time for dumplings. So, stay alert ninja warrior! Because this master of Kung Fu will be demonstrating his superior skills on the new episodes, every week from Monday to Thursday at 11:35PM only on Nickelodeon, GOtv channel 62. One evening dedicated to ordinary people participating in the events of 9/11, starting 6:00PM on National Geographic Wild (GOtv Plus channel 51). The Miracle of The 9/11 Surfer reveals what could be the last, untold survival story from the September 11th 2001 terrorist attacks in New York. This is the extraordinary story of 9/11 survivor Pasquale Buzzelli who rode a blizzard of falling debris from a 22nd floor stairwell and lived to tell his story. It features an awe-inspiring account of the events that led to Pasquale’s survival against all the odds and provides new inspiration from one of America’s darkest days. Premieres on September 11, at 7:55PM on National Geographic Wild (GOtv Plus channel 51). In addition, as a GO-getter, catch some great local channels on offer in digital quality on GOtv, including – NTA International, STV, AIT, MiTV, LTV and Channels. Please note that programming, dates and times are subject to change. 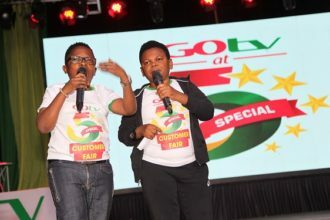 In addition, please note that different channels are available on different GOtv bouquets and in different countries.